Now that VP Mnangagwa has said next year's elections will be free and fair and free of violence; will this be enough to reassure the Zimbabwe Social Democrats and make them contest the elections? The short answer is ZSD take the issue of free and fair elections very, very seriously and will not be so easily impressed by people who say one thing whilst doing the exact opposite. ZSD will contest the next election on one condition and one condition only, when the democratic reforms agreed in the 2008 GPA have been fully implemented and the democratic right of every Zimbabwean to free, fair and credible elections is guaranteed. "Zimbabwe's Vice President Emmerson Mnangagwa on Friday pledged that next year's elections will be peaceful, "free and fair" despite opposition concerns about electoral interference," reported Spotlight Zimbabwe. "We believe that we shall have a free and a fair election during 2018," VP Mnangagwa told reporters, pledging that the upcoming presidential and parliamentary ballot would, like the last, be "free of violence." There is nothing in VP Mnangagwa's vague statement to assure anyone that next year's elections will indeed be free, fair and credible in that they will be devoid of all manner of vote rigging irregularities and of intimidation and coercion, not just wanton violence. AU election observers said Zimbabwe's 2013 elections were "relatively free of violence". They were comparing those elections to the 2008 elections which every outside observer team, not even the AU and SADC teams renowned for giving a thumbs-up to some really dodgy elections in Africa, had condemned because of Zanu PF's blatant vote rigging and wanton violence. 1) In the four months of operation "Mavhotera papi" (Whom did you vote for! ), April to July 2008, President Mugabe brutalised the nation. The wanton violence was to punish the people for having rejected him and his party Zanu PF in the March vote. He managed to overhaul Tsvangirai's 73% vote in March to turn it into an 84% victory in the July; one can only imagine the brutality involved to achieve such an electoral feat. Ever since Zanu PF has only needed to remind the people of the horrors they suffered in 2008 with the bear minimum of force to get them to do as they are told. The people have good reason to fear the regime because it's ability carryout another operation Mavhotera papi is credible. The regime has lost its foot soldiers of 2008, the war veterans, but has since replaced them with its equally zealous and fanatical party youths. The State Security organs, the Judiciary and all the other state institution who carried out the heavy duty and operational tasks of the operation have not been reforms and therefore firmly in Zanu PF control. President Mugabe has often boasted that he has several degrees in violence; he is certainly a Niccolo Machiavelli scholar is his own barbaric way. 2) In 2013 Zanu PF had a war chest full of cash, unlike 2008 when the party was squeezed for money, from all the wholesale looting of Marange diamonds, to bankroll it's elaborate and very expensive vote buying and vote rigging schemes. Many people believe the regime spend US $ 4 billion in 2013 elections and it is already spending money hand over fist, it will probably spend US $ 10 billion by the time the last 2018 vote is counted! A year and half ago President Mugabe admitted the country was "swindled" out of US$ 15 billions. To date no one has ever been arrested and not one dollar recovered. The looting has gone into overdrive; the regime is loaded with cash, there is no doubt about that one. 3) President Mugabe must be thanking his ancestors to this day that not even one democratic reform was ever implemented in the five years of the GNU. SADC leaders tried their best to remind Morgan Tsvangirai and his MDC friend to implement the reforms during the GNU but no one listened. Just a month before the July 2013 elections SADC warned MDC leaders they should not contest the elections with no reforms in place but, again their warning fell on stone deaf ears. Morgan Tsvangirai & co. must be some of the most corrupt and incompetent politicians who have ever lived; having sold out during the GNU President Mugabe knew they would do so again. Even after MDC leaders were warned the July 2013 would be rig and they could see this for themselves they still, nonetheless, contested the elections. 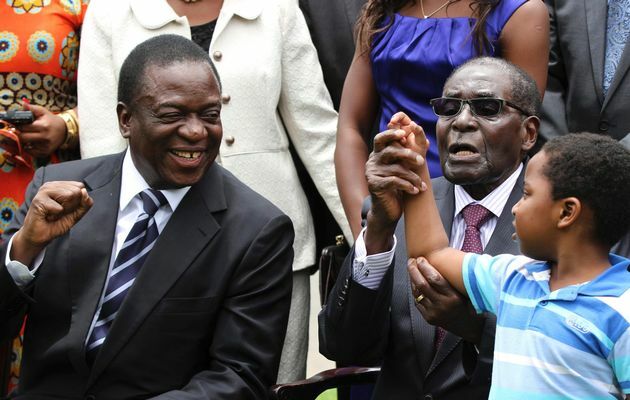 President Mugabe knew that as long as he offered them a few gravy train seats, MDC leaders will contest the elections. He needed them to contest just to give the process some modicum of credibility. Although Tsvangirai & co. vowed they will not contest another election until reforms are implemented they are already queuing to contest next year's elections although they all admit not even one reform has been implemented. How stupid is that? How lucky is that for President Mugabe!!!! In their report of the July 2013 election, the AU election pointedly refused to say the process was free and fair and listed instead some of the glaring irregularities such as the failure to release a voters' roll, denying nearly one million individuals the vote because their details were not in the constituency voters' roll they expected, etc. Zanu PF, for its part, has pointedly ignored these irregularities and insisted the 2013 elections were free and fair. Zanu PF has refused to implement any democratic reforms of such key institution as ZEC so that none of these blatant vote buying and vote rigging activities ever happen again. In other words VP Mnangagwa's talk of next year's elections being free and fair is just hot air! We in ZSD condemn Zanu PF's continued refusal to implement the democratic reforms to ensure free, fair and credible. We see this as a fundamental human rights issue and necessary pre-requisite for the country to get out of the economic mess and political chaos the regime has landed us. The root cause of our economic mess and political chaos is the country's failure to hold free and fair elections. We in the ZSD condemn those in Zimbabwe's opposition camp who continue to contest these flawed elections giving the process credibility for their own selfish reasons.